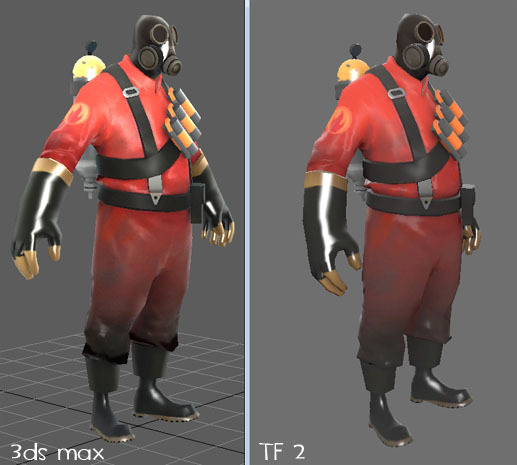 While I�m working on some custom models for TF2 I thought it would be faster to see the TF2-shader already in the max viewport. Info: I'm discontinuing verson 0.2x because it is now implemented into my toon shader. - you have to apply a diffusemap, normalmap and a ramp texture, without these textures the shader won't work. - if the shader still does not work, add a texture to every material port. If this doesn't help too, drop me a line, thx! Again thx to Lumonix for this great app. The model and texture are � 2009 Valve Corporation, all rights reserved.